So all my frantic ice making preparations for Hurricane Sandy were an epic fail for keeping the power on along the east coast. You thought I was joking about that, but usually when I prepare for something, it doesn't happen. 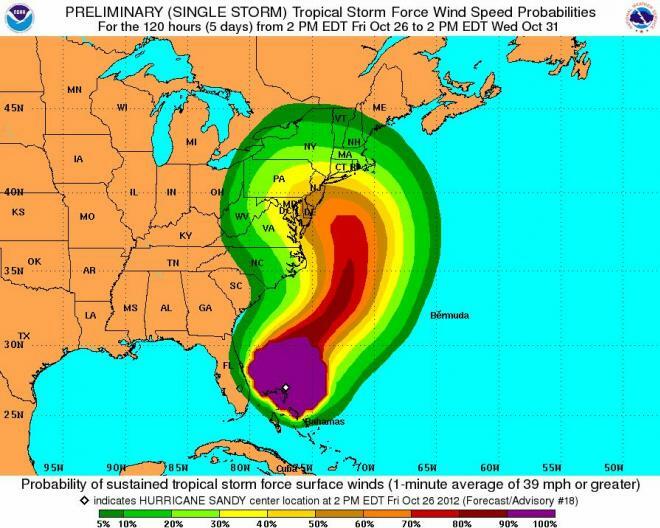 To everyone in the path of Sandy ... sorry. I did my best. We lost power for about 24 hours. That wasn't the only epic fail we experienced. We lost our land line phone service. But, hey, I have a cell phone, right? hmmm ... well sort of. I have this simple cell phone. It cost $20 for the unit. The service was the cheapest I could find - $20 every 3 months through Virgin Mobile. Early days with this plan (2009) I used it so little I had accumulated about $90 is unused minutes. I was and continue to be - a low user of cell phones. Mom got sick a few times prior to 2011, and then she was sick pretty much all of 2011! I used that $90 quick. Now why would I tell you this story? Well here is the real epic fail of my phone service. My house is a dead zone for my cell phone. Ha! No problem, since I have a land line in the house. The power goes out. No lights. My land lines go dead. No phone. No problem. I can use my cell phone to report the outages. Oh, that is right. I need to stand outside to make a call. Remember - if I go into the house with my cell phone to make "the maneuvers," my call will be dropped! Can't do that. ahh ... it is very dark in the house. We have 5 telephones on 3 floors. He must stumble his way around the house using a flash light and his poor eye sight to do my bidding. Wet. I am very wet. Oh, and before you say my husband should use the cell phone and I should disconnect the land line phones - you need to know he doesn't use cell phones. It is a thing with him. So the "maneuvers" didn't work. We are still without land line service. But we still have our trusty $20 cell phone - which is soon to be history. I think I will maneuver this little Virgin Mobile phone with its stinko network into the trash and get myself a "big girl" phone ... I think an iPhone is looking pretty sweet right now! Two epic fails in 24 hours is quite enough for me. Today makes me want to sit by a window and just watch the rain pour out of the sky. Thankfully the rain is still only pouring straight down ... not side ways with great winds like expected this afternoon and evening. It is funny how weather can make you feel energized or sedentary. It is a sedentary day for me right now. But 8 days ago, the weather was perfect and I was walking around the NY fair grounds at Rhinebeck. The Sheep and Wool festival was in full swing. It began with a bus ride. And not just any bus ride, but one where almost everyone was doing this ... so nice to be surrounded by my "peoples." Of course, you know me now pretty well. I had to do something a little different. Yes, that is me in the bus bathroom. but I also legitimately needed to take a picture. Thank God that small area had hand rails all around! challenge level of using the pot successfully. The fair grounds were spectacular. No inadequate words from me are needed. And then, of course, the best of the best - a picture of me with my cousin. The bus trip was arranged by my cousin's yarn shop - Gosh Yarn It. Cute and catchy title for a yarn shop I think. They also have these very cute bags that I have been coveting for some time. (I know coveting is a sin, but it isn't like I am coveting something sinful, like some one's husband. Mine is a small covet.) Here is a close of up the bag. The day ended with a return trip over the Hudson River. Beautiful place to have your gy-normous summer mansion if that is your style. Actually rain is just fine with me. I love rainy days (even Sandy-Rainy-Windy days) as much as I love sunny ones. Did I buy anything at the fair? Gosh, yes. Need you ask? No yarn, though. Hard to believe right? Do you need a reminder picture of my yarn closet? Pictures on that to follow at some point. On a severely rainy, windy and generally stormy day like today (yet beautiful in its ferocity - Thank You Hurricane Sandy), it is pleasant to remember another beautiful and the fun filled weekend in Pennsylvania and New York - just 10 days previously. It all began with a wonderful drive up through Pennsylvania. It took hours and hours, mostly because I made a few stops before my destination. But I find that I enjoy driving long trips by myself. It wasn't always the case. But over time and with a few trips under my belt, I have discovered the joys of day traveling by car as a solo traveler. Sort of like a private adventure - time for thought, time for audio books, less stress when I get lost - which I did a few times - it is all good. Maryland has hills. Pennsylvania has mountains. Mountains that make your ears pop. Pennsylvania was also a few weeks ahead of us in the leaf colors. My cousins live on a large area of land on top of a mountain in Northern PA. Their "driveway" is about 1/2 mile through the woods and up a rugged hill. All wheel drive is pretty much a requirement. My cousins' drive way - looks beautiful and is beautiful. It is also "Mr. Toad's Wild Ride." I couldn't seem to capture a picture that would show the "wild,"
Looking down the hill beyond their entrance to "Mr. Toad's Hill" is the beautiful view . The hill continues further down another 1/2 mile or so from this point. But the real challenge is looking up ... and up ... and up. And if you look closely, you can see one of the houses just between the trees. As you are nearing the house the road is bordered by a rock wall. A charming feature I have seen in other areas like Gettysburg. The hill is kind of a "major event" for me. I decided on my first day to walk the one mile trip to the bottom. Some areas were so steep that you had to be very careful with your footing. Falling on the uneven rock bed was not on my agenda for the day. And as I was descending the very steep parts near the bottom, I gently reminded myself that I had 2 ways back up the hill. I could walk back up, or I could call my cousin to drive down and pick me up. Yeah! Right! I wasn't calling my cousin! No way. I am an active healthy person and I can do this. And I would do it if I had to crawl on my hands and knees. And so I began the trip up with a positive attitude. After about 100 feet of walking (do not laugh), I stopped. I checked my phone (you know, to make sure it was working,) took a picture of the surrounding trees, breathed deeply, checked my pulse rate, retied my shoe laces, checked my pulse again, deep breaths - and decided I could continue. The road flattened for about 20 feet and then got remarkably steep again. You can do this! Just keep breathing. Got to the next flat part and decided to recheck my shoes again! :-) Yep, shoes were still on my feet! Breath, breath. Yep, phone battery still charged. Breath. Pulse pounding strongly in my ears so that is a good sign (right?). A heart attack on this hill was not on my agenda for that day either. And so it went. By the time I got half way up the hill, I got my sea legs for this little jaunt and was able to make it the rest of the way up without stopping. I did, however, began to peal off clothing before I made it to the house. I was still decent when I walked into my cousin's house, but the thought did occur to me that under pants and a bra were really all that was needed in 50 degree weather. More clothing is just ostentatious. I spared my cousin that experience. I love her and want to be invited back again. Later that day I learned there was a story to those steep and flat parts of the road. Apparently my cousin's grandfather built that road a long time ago. He build the flat parts so that he had a place to "rest the horses." The man was a genius ... just say'en! Tomorrow .... (if I have electric - remember Sandy is being a witch outside) ... if I have power I will share my time at Rhinebeck. Great fun. Yeap! My house is right in the path of this storm. I have been working on my post from last weekend's trip to Rhinebeck and the thought occurred to me. EVERYONE, and I mean just EVERYONE is stoked about Sandy. Maybe I should write something about that. Wouldn't it be a total hoot if Sandy did the "female thing" and changed her mind about where to set down on land? Wouldn't everyone get a chuckle if she turned a hard right and headed right back to the African coast? Ok, so that probably won't happen. But I have taken steps to ensure that electrical power stays on during the storm. Been making ice since Wednesday for the ice chest and for any empty spaces in my two freezers. I ain't loosen any frozen food this time. No sir! Will make coffee in advance 'cause I am not facing even one frick'en morning without caffeine for some broad named Sandy. Pulled in the lawn chair and the bird feeder - cause I am not going to spend money on new ones because of Sandy blowing into town. I am prepped. We will not loose power now because of all my preparations. You can thank me after it is over. In fact, I have made (and bought) so much ice, I would guess that the entire eastern seaboard is safe now from power outages. The big story on the news in a few days will be how the lights stayed on. They will wonder why. But I will smugly point to my freezers that are filled to the brim with ice! I will know. Oh ... and I have red wine. Best at room temperature, you know. Family and Yarn - a dynamic combo! This weekend I am heading up to visit my cousins in Pennsylvania for a family weekend and I am so looking forward to it. Sunday we are getting on a bus and going to Rhinebeck - New York's Sheep and Wool Festival. I am pretty stoked about that! This is also the weekend I pick up my new loom (new to me) - a larger size from the one I currently have, with a stand. This was a real buy - less than half price off a new one and only used a few times. Also stopping on my way up into Pennsylvania to visit a cousin-in-law for lunch! A full and fun-filled weekend. See you on the other side of it! Gosh, it has been a long time since I made a guest appearance on my Grandma's blog. Time to correct that error in judgement on her part! Of course, she types faster than I do so I will be brief. Every Thursday I go to my Grandma's house. Today I arrived to find - a new coat!! So just sit back and take in the glory of me and my new duds! So here I am showing off the colorful pattern and the details of my new coat. should that ever happen to me! Again, this is me ... showing off a bit of my wonderful physique! My hair is so sparse and short with no fat that I get cold - hence the jacket. From the top - really quite perfect for the cold weather. protecting from the cold my ... ah .... well, you know what is there. Now all my Grandma needs to do is find something for my delicate ears! From what I hear of my Grandma's thoughts, she now must find something special for her other two granddogs - Meathead and Grimace. She tries to keep things even in the "giving" department. But coats for them would be almost cruel because they run to hot, hot, hot ... all the time hot. A little background on the coat: Good Shepherd Dog Coats is the company that makes these coats for dogs. "Made in the same manner as our durable and warm lamb coats, which are relied upon by shepherds to keep their newborn lambs thriving and comfortable in winter, Good Shepherd Dog Coats will keep your dog equally warm and cozy in cold weather." I found this vendor at the Maryland Sheep and Wool Festival. Because French Bulldogs do not run to standard sizes, I had to have this coat made specifically to Milo's measurements - which they are happy to do. If you are interested in this vendor, they can be found at www.goodshepherddogcoats.com. Apparently they do make coats for lambs as well (www.goodshepherdlambcoats.com). with those who might be interested. 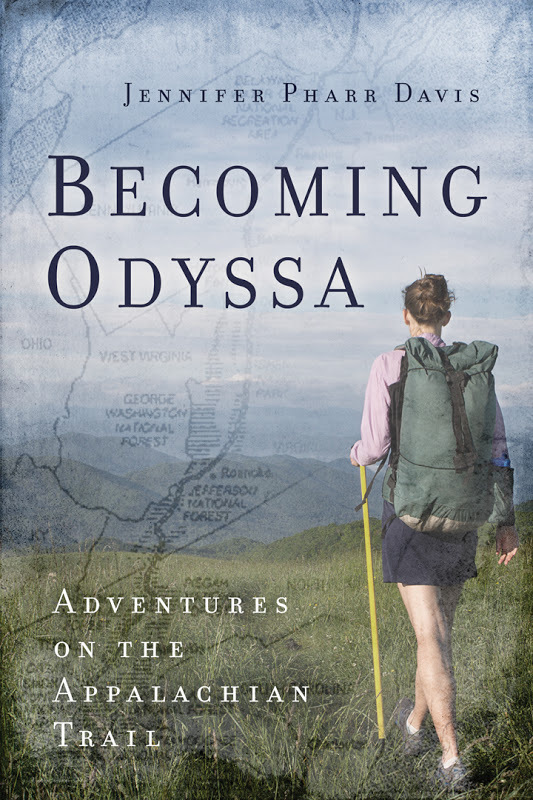 I have just finished reading a wonderful book by Jennifer Pharr Davis - Becoming Odyssa: Adventures on the Appalachian Trail. There was nothing virtual about this story. It all starts with a simple premise. When Jennifer graduated from college she didn't know what she wanted to do with her life. She decided to hike the Appalachian Trail by herself and take time to think about her future. This is the story of her solo hike on the AT and I found it fascinating. And believe me when I say ... her journey wasn't simple. 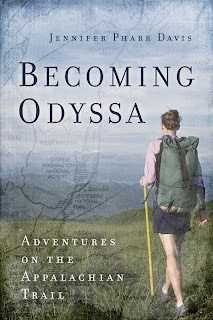 I have read a few books about the experiences of those who hiked the trail - Becoming Odyssa is one of my favorites. I found a YouTube video where Jennifer talks about her experiences on the trail that first trip (she has since walked the trail again and set the fastest time for a woman thru hiker on the AT). You can find that link here. It runs about 30 minutes, but you don't need to watch all 30 minutes to get a flavor of who she is and what her book Becoming Odyssa is about. Even if you aren't into hiking or walking, I know you will enjoy this book. For anyone who knows me or who has followed this blog ... you know I am a big believer in researching stuff: books, blogs, websites, talking with others with similar experiences ... you name it! My "fall focus" is reducing clutter. There are alot of current reasons why I am so focused now, but there is a long history of "pitching" stuff to make more space and less stress in my life. Reducing clutter seems to go hand-in-hand with simplifying life in the materials I have seen. While I didn't start this clutter reduction process to simplify my life, it seems to have that natural outcome. neatly stacked in your basement. you are actually just hiding it. Pretty simple stuff, right? But for some reason the idea that you can't organize clutter never occurred to me. And I totally agree with this statement. In my professional life I was a big believer in organization. I thought there was no substitute for a well ordered professional life, organization made things easier in the end, and I was recognized time and time again for that quality. I am not so rigid in my personal life, but I do think that it helps things run more smoothly. But the simple idea that organization isn't the answer to a clutter problem was a new thought for me. 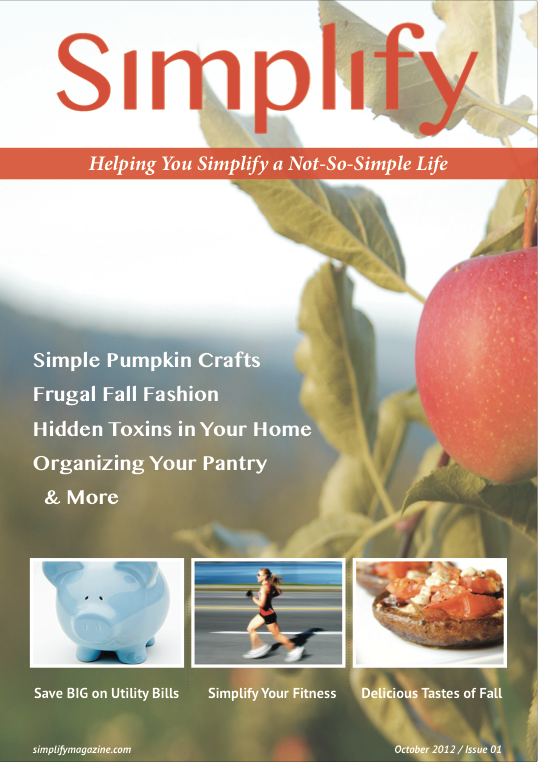 If you are interested in simplicity, or downsizing, or decluttering, or just trying to get control of your environment ... check out this free monthly online magazine. 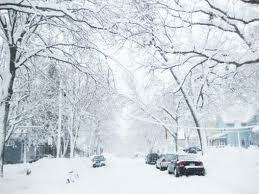 I heard on TV that this year they are going to name big Winter Storms ... you know, like they name the Hurricanes. Let's name this one Chill'en Cherilyn! At first I thought ... oh no! Naming weather snow storms. Whose stupid idea was that? As a Winter Lover ... I am so excited. Read more here on this story. I can hardly contain my excitement!!!! Time to take accounting of what I did and didn't do in my walking program. But it wasn't as pretty as it looks here. Several days I fell below 5,000 steps. Of course, other days I was thousands of steps above my goal average. This is why I like to look at averages over a month's time. I made my step goal average for September. Time to bump the goal up to 11,000 steps average per day for October. Looks like that goal will be do-able. Bumping my step goal each month has been a good way to keep focused and increase my activity. I haven't decided what the final goal will settle out to be - obviously there is a normal ceiling for most people - what you physically want out of your exercise and how much time you can devote to the pursuit of a number. I am not training for anything. I am just trying to find a good fitness and energy level. So I am still undecided what makes sense for me! But I am pleased with my progress. that goes back about 50 years. Sorting and discarding is part of my deep de-clutter process for this fall. We have the greeting card collection my mother-in-law left behind (she died in 1997), and I have avoided taking action on this for a long time. She was a person of very moderate means. Her apartment was her castle - it resembled a gift shop more than a home, but everything was perfectly arranged, orderly, clean, and loved. 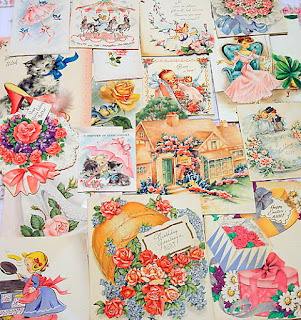 And she loved greeting cards - she saved every one given to her. Because they meant so much to her I was unwilling to discard them after she died. But the downsizing process can be brutal - we haven't even gotten down to shedding the stuff we care about yet ... much less holding on to the things that she cared about. Today I tackled that large box of cards. It has made me sad in unexpected ways. Discarding the box without opening it would have been the easier path. I didn't do that. I examined every card. It was fun to see the progression of my husband's signature (and my childrens' signatures) as they matured. Most cards did not have dates so there was no way to determine age except through the immaturity of the signature, and the classic look of the cards. I did find some cards that had notes in side - I kept those. Most of her cards were from family. There were, however, a few affectionate looking cards signed Steve, and then others signed "J." She was divorced from the time my husband was 7 or 8. There was nothing beyond the signature from Steve or "J" (and that was how it was signed - with quotes), but they are part of a life long gone and the details were known only to her. And so I kept a few with personal notes that reflected some history. The others are gone. Kind of sad. But I content myself with the thought that most of those cards were her memories - not ours. I have kept a small sampling of her cards with respect for the history represented in some of them. Interestingly, I followed in her path as a newly wed in keeping greeting cards. So, yes, I have a large number as well. The review is ahead of me. I'll will keep enough to remember, but most will be discarded as well. Maybe 30 years from now my own children will be looking and deciding what to do with mom's greeting cards. 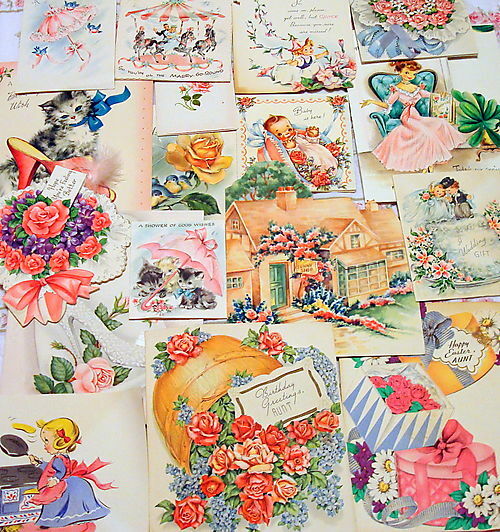 Do you save greeting cards?